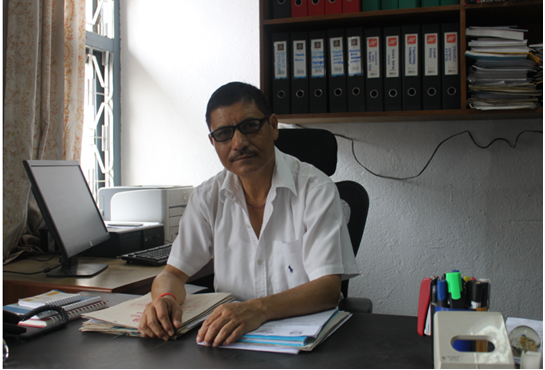 Gyan Bahadur BC is a Planning, Monitoring and Evaluation Officer at the Government of Nepal’s Department of Health. He analyses patterns in the consumption of health supplies, using his findings to inform decisions on medical supply chains, and to guide policymakers on health sector reforms. Until relatively recently, the exchange of information between health facilities at the district level and the central level in Nepal was coordinated through a paper-based information management system. The lack of timely and reliable data on stocks of medical supplies caused problems for those making decisions on allocations and resulted in stock shortages and delays in supply. As one of these decision-makers, Gyan is responsible for allocating 206 health commodities including 70 types of medicines through a supply chain including central stores in Kathmandu and Pathalaiya, five regional medical stores and 75 district-level stores. For this he requires timely and accurate data on both current levels of stock and previous consumption patterns, so he can calculate the amounts that need to be purchased to meet the demand of the upcoming year. Recognising this need, the Department of Health set up an online logistics inventory management system to provide real-time data. Using the data from the online system Gyan is able to determine which district medical stores have more than five months’ worth of supplies, which have nearly expired medicines, and which have run out of supplies. Gyan uses the data to determine the fluctuation in stock levels, helping him to coordinate resupply of medicines in regions and districts where there are urgent needs and ensure essential medicines and health supplies are available all year round. Using historical data to estimate demand for condoms: In 2010, a supplier contracted by the Ministry of Health for supplying condoms over a three-year period discontinued the contract specifying an increase in the cost of raw materials. Having received just 15.5 million condoms in the first shipment, the health facilities were faced with the risk of running out of condoms in no time. By using information from the online inventory system, Gyan and his team were able to identify how many condoms were needed until a new contractor was hired. Based on the numbers they took an immediate action to move stocks from district health centres to where there were urgent needs and placed an emergency order through a donor agency to prevent a country-wide condom stock-out. Using stock-take data to identify areas of need: In 2014 a medical store in Butwal, Western Nepal, reported a shortfall of 25,000 bottles of Ringer lactate, which is used to treat cases of diarrheal disease. By looking at the inventory data Gyan and his team were quick to discover that regional medical stores in Biratnagar in Eastern Nepal had an overstock of the solution. By transferring the surplus stock they were able to meet the urgent needs of Butwal. Using data to generate procurement reports that prevent shortages: Gyan’s team analyses the data on health stocks and repackages it in quarterly situation reports for other divisions in the Department of Health – including the Family Health, Child Health, Epidemiology and Diseases Control Divisions. These reports inform their procurement decisions and have led to a reduction in health stock shortages, wastages and instances of overstock. “Unavailability of the internet, electricity backup and computer accessories in some districts are hindering the flow of information, making it difficult for us to carry out timely analysis and quick supply decision-makings”. Poor internet connectivity, electricity back-up and computer equipment in the some districts are a major challenge for Gyan and his team when trying to collect the data online. Not all medical stores at the district level are able to update their data on a regular basis due to internet problems. It is also difficult for Gyan to get accurate information from the district health facilities. Many health facilities still record their orders for stocks using a paper-based system as they do not yet have access to the online inventory management system. This data on the needs of health facilities cannot be recorded in the online inventory system until Gyan’s team spends considerable time verifying the data: it takes the team almost three months to manually enter data from all the health facilities in the online inventory system, causing delays to the allocation process. The high turnover of staff in the medical stores in the districts is another challenge for Gyan. It takes time to train staff to operate the logistics inventory management system, and frequent transfers of fully-trained staff to other government positions have caused errors in data entry. The time taken to resolve these errors hinders the monitoring of health supplies, causing a delay in the generation of procurement reports and risking shortages and wastages.